Event co-organised with the division "Accelerators" of the SFP. 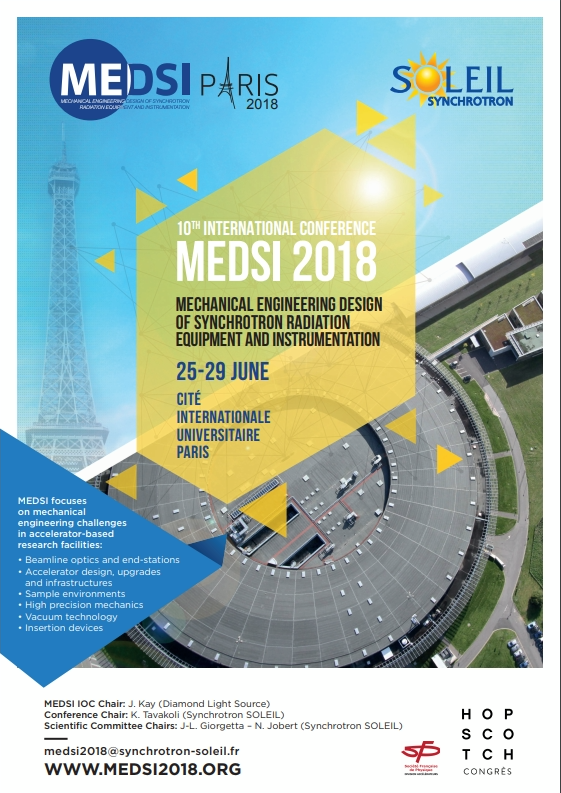 The 10th edition of the Mechanical Engineering Design of Synchrotron Radiation Equipment and Instrumentation (MEDSI) conference, will take place at Paris, France, from 25th to 29th of June 2018. MEDSI is the main biannual event for the engineers from worldwide synchrotrons to showcase and exchange cutting-edge developments in mechanical design and engineering of synchrotron-based instrumentation. MEDSI 2018 is hosted by Synchrotron SOLEIL and supported by French Society of Physics (SFP).